Nintendo has announced its next mobile game, and it'll be based on the company's long-running Mario Kart franchise. 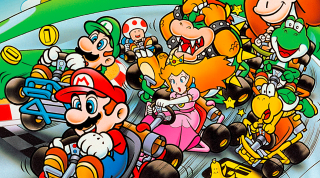 We don't have any other details about the game other than the name – Mario Kart Tour – but presumably it'll feature the same fast-paced powerup-fuelled racing mayhem that the series is known for. We've got our fingers crossed that Mario Kart's addictive multiplayer element will make it to the mobile version intact. Nintendo's mobile efforts have, so far, been a little hit and miss. It recently announced that its Miitomo app will be shutting down in May, and many were disappointed by the free-to-play elements of its last game. Animal Crossing: Pocket Camp. However, Super Mario Run was much more warmly received, marrying the complexity of a Mario game with the simplicity of a single-control smartphone interface. With a release date of "the fiscal year ending March 2019" – which means a release could technically come as early as April 2018 – fingers crossed we won't have to wait much longer for more details. Nintendo did not address the rumors that it is developing a mobile version of its acclaimed Legend of Zelda franchise.